Today i return home from a study tour in Singapore. I originally arrived in Singapore on the 20th of June to spend some time with my girlfriend and get used to the new place. Singapore has surprised me in many ways, from its multiculturalism to its education system. One thing that engaged me the most was finding out how much the government cares about science and being able to see its relevance not only for the country, but for the global community. I learned so much on the study tour not only in my field of nanotechnology, but also in business and education. It seems to me that if you want a quality research program then go to Singapore where the government is eager to help. I would like to come back to Singapore some day, not just for the food, oh now there was some amazing food there. I could get lost in my thoughts just relishing in the never ending gastronomical possibilities that exist in Singapore. Upon returning to Australia it just hit me how different the two countries are. Just turning on the news and listening a bit, i see how different our attitudes are to those in parliament. While in Singapore the government is treated with reverence, here back home we treat them harshly, questioning their every move. The little things also remind me im back home, such as how expensive it is to eat lunch in Australia. In Singapore you can get a filling meal with your pocket change, not so easily in Australia. But the land don under has one thing the Singaporeans don’t have, good fresh coffee. Oh how i missed my cappuccinos and espressos, where ever you go in Melbourne, you can be sure to find good coffee. I guess that’s all i ask for Singapore in the future, don’t change one bit but import some real cafes. Today marks the last day of the Nanotechnology Singapore study tour. Our first stop was to visit the Institute of Medical Biology (IMB) and receive a presentation from a fellow aussie Victor Nurcombe. His current research was into natural sugars and their ability to regrow bones, which was evident in rabbits, fish, pigs and mice. Their next step is in a human trial. 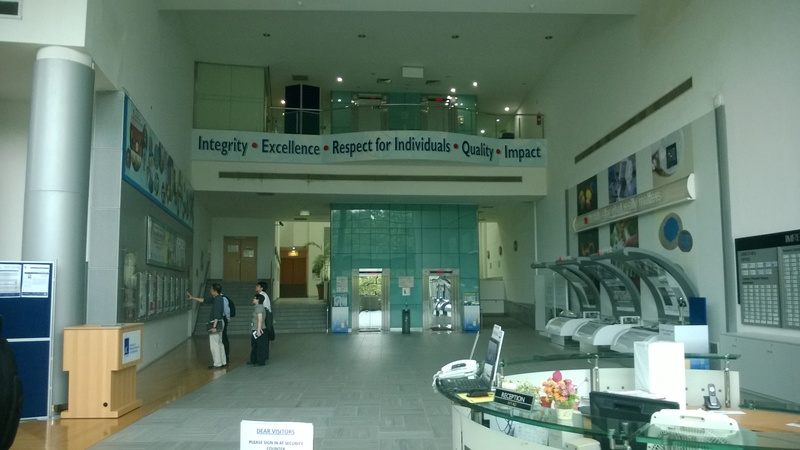 After our visit to IMB, we headed back to NUS to visit the Singapore Synchrotron Light Source (SSLS). This place was intriguing since it had 1 working synchrotron and 1 on standby in case the first fails. After the visit to the SSLS we made our way to our last visit back at IMRE. This was a nice way to end the trip by going back to the first institute that we had visited. At IMRE we had some coffee and tea and relaxed and talked to various people, including some professors. After this little sit down, we headed off outside and said our farewells to Paul and Dongchen. After the study tour, i had almost an extra week in Singapore. I used this time to do some activities that i didn’t have the chance to do during the study tour. Today was a less intensive day compared to the rest. The first half of the day we stayed at NUS and worked on our group assignments as Team Nano. We were able to make progress through these and get a start on preparing which one of the A*star institutes to present. After our group work we made our way to the CREATE building in U Town. This building has been looming over us our entire stay in U Town and we are finally able to visit it. The building is part of the Singapore MIT Alliance for Research and Technology (SMART) which primarily researches biomedical technologies. Once inside we had a tour of a few labs inside the CREATE building. Our visit to the CREATE building was a short one which gave us free time. A group of us decided to play a quick game of basketball, this turned out to be 2 hours, but it was time well spent having fun in-between visits. After the game we headed off for a glorious and refreshing shower, i ate dinner then crashed in bed embracing sleep. This week end we had free gave me some much needed time to relax and recuperate. My highlight from the week end would have to be the time we spent at Wild Wild Wet. We spent a sizeable amount of time trying to actually leave NUS. Im not sure how long we spent waiting around for the local bus to take us to Kent Ridge MRT station but it was too long, so in the end we decided to take a taxi the way there. The water park was no disappointment, at only 19 dollars entry and access to all the rides we had a wonderful time in the wet. As we departed Wild Wild Wet, Nick and I chose to go to Orchard road and do some shopping. We went together and found ourselves at Ion, a massive shopping complex that gave us many options of where to shop. This place was the first shopping centre i have been to in Singapore and it did not fail to disappoint me. Today was the second part of a 2 day intensive NTU tour. Our first stop was at the Energy Research Institute @ NTU (ERI@N). It seems to me that the people in Singapore like there acronyms and want to have the best looking ones compared to the rest. This was an interesting place to visit and get to see all the different technologies they have produced. My main interest here was seeing in a little diorama how all the different technologies work together to make a cleaner more efficient city. This was a nice visit as it allowed us to see the impact the research will have on the future. After ERI@N we had 6 presentations prepared by PhD students with varying fields of research. After these presentations we were given a tour of the labs that a few of these students used. The most exciting one that i saw utilised quantum technology and form Bose Einstein condensate. This was my favourite since it had an experiment running and you could see the cloud of atoms in the centre of the apparatus. Today was the first of a two day intensive tour of the Nanyang Technological University (NTU) and facilities. It started out with an intensive presentation of the Singapore Institute of Material Technologies (SimTech). This gave me a greater understanding of how Singapore is able to be such a developed and rich country with no natural resources, unlike Australia. This presentation illustrated how Singapore is able to be a big competitor in manufacturing by taking advantage of its greatest resource, its citizens. When the presentation concluded we made our way to the School of Materials Science and Engineering department of NTU. Here we were given presentations by PhD and Masters students on their research topics. The presentation I was most intrigued by was the study on the sucker teeth of the Humboldt Squid. This showed how nature has already beaten humans to the nanoworld by showing the structure of the teeth as being comprised of non-mineral nano-tubular proteins. From this I learnt that sometimes if you want to do something right, just look at nature. To finish of the day we had a tour of the labs. Inside one we found a number of different electron microscopes with specific functions that I have yet to understand fully. The next stop was the Biomaterial Labs which was interesting seeing heat stints that have a layer over the actual stint and inside is a drug which gets released into the body to help cure the cardiac disease. The final lab visit was to the Organic Materials Service Lab. Inside was research into imprinting of biological cells onto a polymer film. Today was a nice day. We started with a trip to Republic Polytechnic and were also able to meet a couple of students there who had gone to La Trobe earlier in the year. It was nice to see them again and great to hear their experience in Australia. Following the presentation about Republic Polytech we had a guided tour around their facilities, my favourite one being the aviation hanger on campus. Inside was a small assortment of aeroplanes and engines in the hanger. Behind this were the working stations where the students were able to practice their techniques on maintenance. In the afternoon after Republic Polytech we made our way back to NUS and met up with a biodiversity group to head off to the aquarium. This was the visit I was waiting for the most today since we were able to go behind the scenes and shown how science applies to the running of an aquarium. My favourite area was the coral tank which was a giant circular tank with coral in the centre and schools of fish swimming around. After our time at the aquarium came to an end, me and a group of people made our way to Satay by the Bay. This was the time that I try my first bbq stingray; to me it tasted like the chicken of the sea. I will definitely be keeping my eye open for more stingrays to eat around Singapore from now on. Today was our first tour of the NUS physics facilities and contact with students studying similar subjects as our selves. We met student’s part of the Special Programme in Science inside their own little headquarters. This space seems like the perfect meeting point for students to meet up and relax or discuss their studies. We had a tour of the facilities and learnt a lot about the different types of instruments on offer, one of my favourites being the linear accelerator which is used by many different fields in science. One of the more interesting uses i found to be the ability to see inside a biological cell and determine its exact make up. After the visit to the particle accelerator we were introduced to the clean room and could see where nanotechnology is applied manufacture graphene sheets and other assortments of nanomaterials. We then moved on to the Centre of Quantum Technologies. In this we had a discussion about quantum entanglement which i could just keep up with and understand. To finish off the day we were taken to a demonstration lab and could put our knowledge of physics to the test. Today we met down at starbucks at 8 o’clock in our fancy dress all primped and proper for our visit to the Australian High Commission. I was a little bit nervous today because this was our first official type of visit. When we arrived at the Commission we had to pass through a security check point. After passing through here we entered the foyer and in it were boards showcasing the Australian and Singaporean relationship. We then had a meeting and learned a lot about the economic ties between Australia and Singapore. After the main body of business was completed I was time for tea and questions, which quickly turned to talking about our favourite footy teams. After we left the High Commission we made our way back to U Town for a quick change of clothes and some much needed food. Our next stop was to the A Star institute IMRE for a tour around the facilities. This was really informative since it allowed me to see what kind of instruments I’m going to be using in the future. It also allowed me to see what possible future I have with nanotechnology. You know a day is going to turn out to be great when you are greeted with thunder storms. That is what we faced today as we were about to disembark. We took a bus trip down to Kent Ridge and caught the train all the way to Raffles Place. 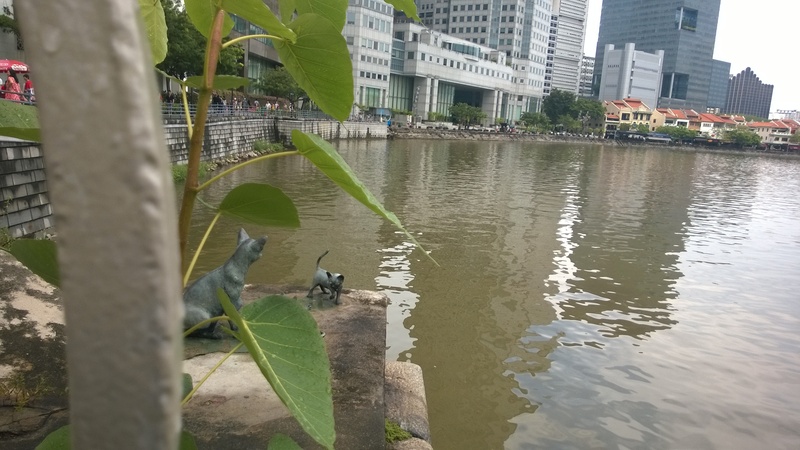 As we were making our way to the Merlion, we passed a couple of statues along the water, my favourite one being the singapura cats playing by the river on the Cavenagh Bridge. We arrived at the Merlion and took a short break so we could take pictures of the icon. Soon after we made our way towards the Marina Bay Sands. Along the way we could hear various bands doing sound checks and getting prepared for the BayBeats festival that was scheduled for the weekend. On the way to the Marina Bay Sands was an interesting bridge in the shape of a helix, appropriately named The Helix Bridge which also had letter pairings along the walkway a – t and g – c to show the base amino acids comprising genes. We ate our lunch in the shopping complex and where spoilt for choice, so of course I chose to eat some burgers. After this much needed feed we made our way to Gardens by the Bay. This area was so vibrant and diverse and showed off the multiculturalism of Singapore. 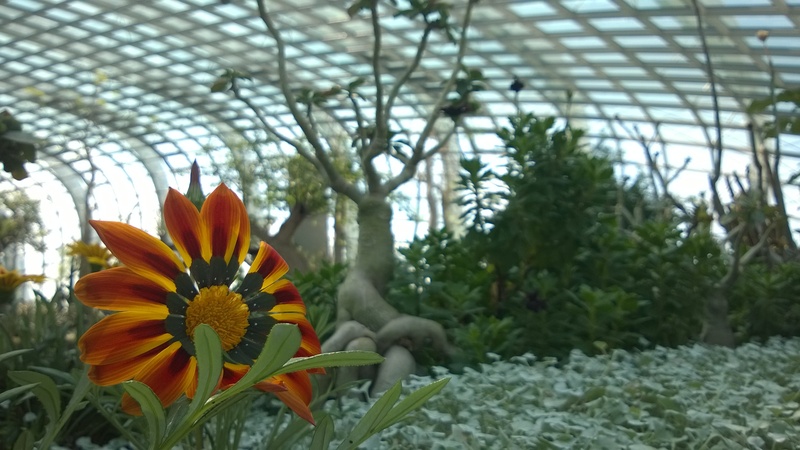 The Flower Dome had flora from all over the world ranging from China to Africa and our own home country. After the Flower Dome we entered the gorgeously refreshing Cloud Forest. This place was exquisite with a massive waterfall that greets you as you walk in. Fair to say there where many pictures taken during today. As the day of planned activities came to a close, me and a few others went off to Funan to look at the massive assortment of electrical goods that has taken over 7 floors.